Welcome to the Frederick Shoppe. 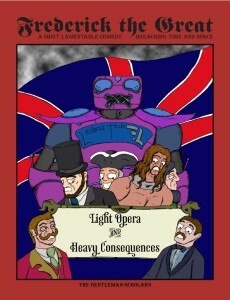 Newest Item: Light Opera and Heavy Consequences! In a past where Gilbert never met Sullivan, darkness reigns. Elder gods rise from the sea, necromancer hunting robots stalk London, and Oscar Wilde is only about seventy percent as fabulous as usual. It is up to Frederick the Great and his fellow time travelers Isaac Newton, Peter the Great, and Abraham Lincoln to reunite the mighty duo and thereby, somehow, save the world. NEW! Two pages from Lord Foppington’s Guide to Historical Personages! NEW! 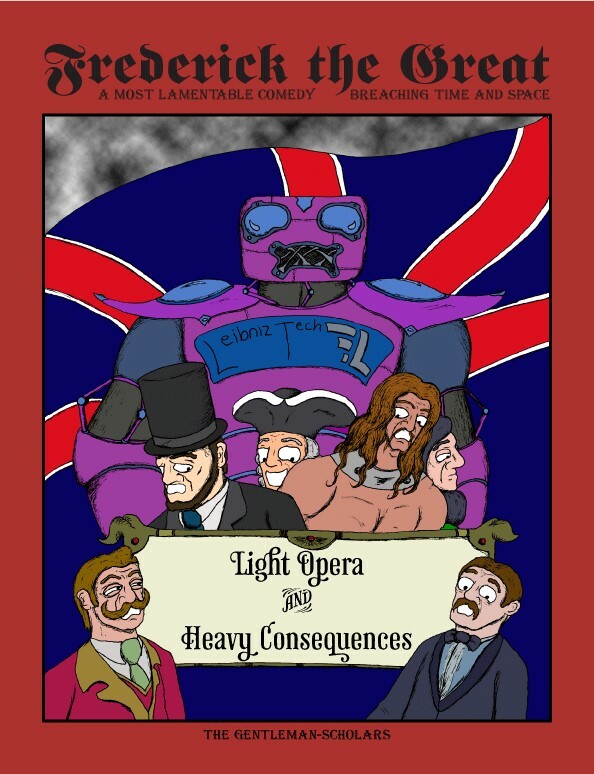 Two new mini posters featuring the allies and foes of the Gilbert and Sullivan Arc! NEW! Complete Listing of the featured Gilbert and Sullivan songs! NEW! Musical introduction for Newcomers by Sir William Schwenk Gilbert! OLD! Full page reprintings of episodes 180, 183, 191, 197, 206-245, and 248! That’s a full, self-contained story arc! All this for a mere $16.00 (plus a mere-er $3 shipping and handling)! I just finished reading Godless Nerdistry, and apart from not understanding ANYTHING in the math essays, I was very happy to find such pithy writing on a variety of topics that interest me. Especially of interest are the thoughts on the post-Hitchens/Dawkins/Harris world of Humanism in everyday life. I look forward to future publications!